I believe in walking. I walk with purpose, even when I’m walking simply for walking sake. I walk briskly, even when I have no where in particular to go. And I walk daily, whether around the town or up and down my backyard. It’s about the fresh air, it’s about the calorie burn, it’s about “setting up house in the heart of the multitude, amid the ebb and flow” of the city, it’s mostly about the escape. One of the things I like about traveling abroad is that I get to see the world by foot. A plane and a car may get me to a city, but once I’m there, it’s my feet that take me for a wander down streets, through museums, and across parks. A few weeks ago I was in Germany during the worst part of the year, the most “off” of the tourist off-season. Despite the cold and the snow, feet were still the most efficient mode of transportation. Heading out at dusk to grab dinner, I was rather taken with what seemed to be a widespread evening ritual. 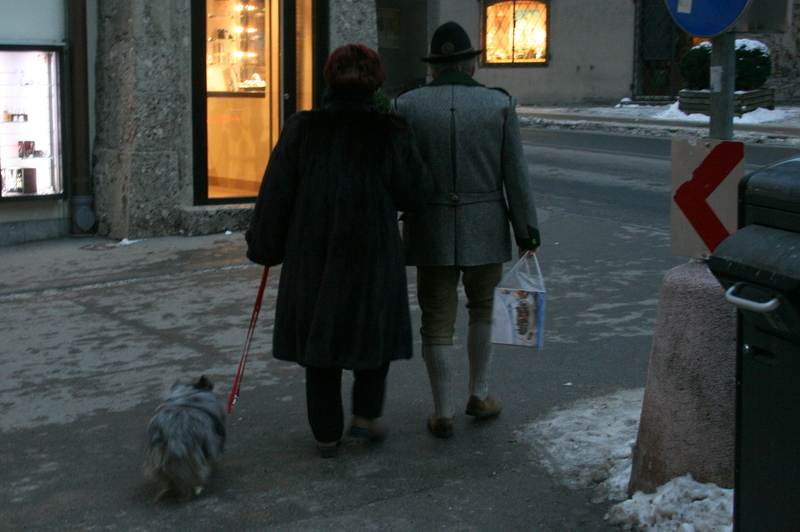 Husbands and wives, bundled up and out on the street, walking arm in arm. The couples were mostly “older” (>40) and never seemed like they had any particular place to be. I was in one town for 3 dinners, and each night the same husband and wife would tip their hats to me as I headed out for some Saxon potato soup. Maybe this isn’t a German phenomenon, but if couples head out arm in arm daily at dusk in New York City, it certainly never stood out to me before. Holding hands? Yes, I’ve seen that a lot. But hand-holding is ephemeral. Arm in arm is a more committed and sturdy physical union, and it’s a NYC rarity. But maybe that’s because people in the Big Apple seem to move too fast to walk arm in arm with anyone else. Carrie Bradshaw wanted someone to stand still with (skip to 7:39), but I think it’s nicer to have someone to walk with. Someone who doesn’t mind ambling 7 blocks with you to get a latte, even when the best cup of joe on the Upper West Side can be easily found at the cafe not 15 meters from your front door. Yes, it’s a lovely idea to have someone to walk with. Not next to, but with — arm in arm, heading down the same road together, both leading and supporting one another as you travel through the day and into the night. Is there a reason why everyone wants me married off?